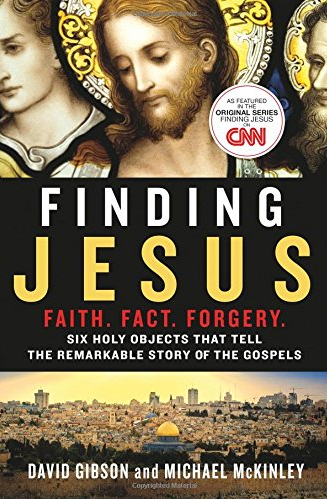 The book that accompanies the CNN series on Jesus will be available in four formats on February 24, 2015. The hardcover edition, published by St. Martin Press, is 256 pages (6.3 x 9.5 inches). The audio editions, published by Macmillan, are narrated by Peter Larkin and run 6.5 hours. Most vendors are accepting pre-orders now. 2. The James Ossuary: The Hand of God or the Crime of the Century? 3. Mary Magdalene: Prostitute, Apostle, Saint—or Jesus’s Wife? "In a mix of engaging scholarship and gripping storytelling, Gibson and McKinley offer a page-turner for a wide audience." —Kirkus. What some sensationalists have been saying has apparently influenced the contents of this series. Why should the possibility of John the Baptizer playing the role of rival messiah have been considered? There were a number of doomsday preachers like him in the Judaean desert, belonging to small, isolated, baptismal sects, and he was the prominent one, having lost his life for attacking Herod. What did he teach that could be compared to Jesus’ teachings? The Mandaeans claim him as one of their prominent members, although their Book of John dates to the seventh century, probably having been written in order to ensure safety during the Arab conquest. There is evidence of Indian (Hindu) and Iranian (Zoroastrian) influence in the beliefs. One Shroud paper even claimed that both Jesus and John were Mandaeans! Joseph A. Fitzmyer, SJ, taken to Toronto to see the ossuary after he had accepted the Aramaic inscription as correct, also pointed out that the artefact did not necessarily hold the remains of James the Just, Paul’s “the brother of the Lord”, first Jewish Christian bishop of Jerusalem. Professor Amos Kloner, who was Jersusalem District Archaeologist for a number of years, also dismissed the claims. The Gospel of Judas says exactly the opposite of what the documentary claims. Name one or two for us, why don’t you? “Brian” doesn’t count…..
His characteristic is very similar to John the Baptist. For Louis and O.K. — From Josephus I get that Banus was an ascetic who lived in the desert. Period. Louis said “there were a number of doomsday preachers like John in the Judean desert belonging to baptismal sects.” NO, that is not what comes out of Josephus. Please, give good examples instead of what seems to be great exaggerations. The main point was to stress the difference between Jesus and John the Baptizer, nothing to do with baptism. The article also points out how exactly Jesus approached the ritual. You should know that water as a means of purification is an universal symbol. Have you seen photographs of Hindus bathing in the Ganges, at Varanasi? Have you studied the origin of Essene beliefs? Nabber, I don’t know what the problem is. There were number of ascetic preachers living in the desert -John the Baptist and Banus were two of them but there were probably more. It implicates nothing. Louis, for goodness sake, you cannot post on this blog and throw in details that seemingly make John just “one of the gang”, and somehow expect qualifiers like “probably” to cut it. 1. No, there were not “a number” of people like John; “probably” doesn’t count when you’re making statements like that. 2. No, there weren’t lots of “doomsday preachers”, there is nothing stating that Banus was a doomsday preacher, and just being an Essence doesn’t make him one. 3. No, you have no record of other “baptismal sects” besides John and Jesus (His disciples doing so in His Name), which clearly the Gospel of John states. There is no record of Banus being a baptizer, which again, his being an Essene doesn’t make him one. Now I hope you get “what the problem is.” Don’t generalize, don’t exaggerate. O.K. has understood, you haven’t. If you dig deeply into the research being done by biblical scholars you will realise that early Judaism was much more divided than hitherto believed. Many people and sects not mentioned in the Bible have been found. Have you read the pseudepigrapha? Money is made with documentaries and books which have sceptics and fundamentalists at the extremes. I am sorry to have to say that whoever is looking for serious research has to look elsewhere, documentaries can be a form of entertainment. The concept of Messiah in Christianity is different from what was expected in early Judaism. I think you know that Jesus assumed more than just a messianic role. If you wish to go deeper read “The One Who Is To Come” by one of the greatest biblical scholars, Joseph A. Fitzmyer, SJ, now retired. The book is expected to guide scholars for decades.